This is a rough draw for Stephens who is playing just her second tournament back following a year out with a foot injury. It’s not an easy path for Halep with the likes of Shelby Rogers, Monica Puig and the number seven seed, Ekaterina Makarova all present in this quarter. The second quarter is headlined by the number three and five seeds, Lauren Davis and Oceane Dodin, and includes a trio of household WTA names looking to reignite their seasons in Jelena Jankovic, Sara Errani and Sabine Lisicki. Dodin plays Jankovic in the first round – the Frenchwoman won their only previous match at the US Open last year. It’s been a sorry year for Jankovic who has won just nine matches in 2017. The Serb snapped a five match losing streak stretching back to Rome to win her first round match in Nanchang last week. Jankovic was unable to back it up, wilting in the sapping conditions in a second round loss to Lu Jing Jing. Errani hasn’t won back-to-back main draw matches since May and plays Risa Ozaki in the first round – a winnable match against a similar type of counter-punching style. Lisicki, who plays a qualifier in the first round, will play her third tournament of the year in her comeback from a shoulder injury. The number four seed, Julia Goerges, will be seeking to reach her third final in as many months after reaching the title match in Mallorca (grass) and Bucharest (clay). The German player will take on the world number 142, Francoise Abanda, in the first round, who successfully came through qualifying at both the French Open and Wimbledon, and won a round at both. The winner will get either Jana Cepelova or Alison Van Uytvanck. AVU is coming back from numerous surgeries in 2016 on her wrist and ankle, and has already racked up 17 wins having started her season in March. Cepelova won an ITF tournament on clay in Budapest a few weeks back. Monica Niculescu is seeded to meet Goerges in the quarter-finals. To reach that feat, Niculescu will need to win back-to-back matches on tour which she hasn’t achieved since the second week of the year in Hobart. The draw is there for her to make inroads – first up for the Romanian player is Nao Hibino who will face a lengthy travel day from Nanchang where she is competing in Sunday’s final. The winner of that match plays Patricia Maria Tig or a qualifier in the second round. Tig was clearly injured at Roland Garros and hasn’t won a match since March. Kristina Mladenovic returns to action as the number two seed in Washington. The Frenchwoman is enjoying a fabulous year, although appeared to show some fatigue during the grass court season where she won just six matches. In any other year six wins would have been solid, yet it felt a tad disappointing for Mladenovic who has been one of the stars of the year so far. If Mladenovic were to make it past the slice-and-dice game of Tatjana Maria in the first round, she would play Camila Giorgi or Bianca Andreescu in the second round. Giorgi has rather quietly put together a solid year, just four wins shy of the total she amassed in 2016. The Italian player was excellent at times on the grass, but did wobble in winning positions. Andreescu will be playing just her second main draw match having qualified for Wimbledon earlier this month. The number eight seed, Christina McHale faces off against Eugenie Bouchard in the first round. Neither has been playing well lately – Bouchard has lost her last four matches on tour, while McHale has managed just three wins since Miami. Both have dealt with injuries during this time. The winner will play a former Washington finalist in Andrea Petkovic or Kurumi Nara in what is another first time match-up. Of the eight seeds, Ekaterina Makarova and Lauren Davis are the only players who have amassed more than five wins in Washington. Davis was last year’s surprise finalist (ranked #122) in what was the beginning of her big rise up the rankings. Makarova didn’t compete in Washington in 2016, but has reached the semi-finals in all three of her previous visits to the tournament. 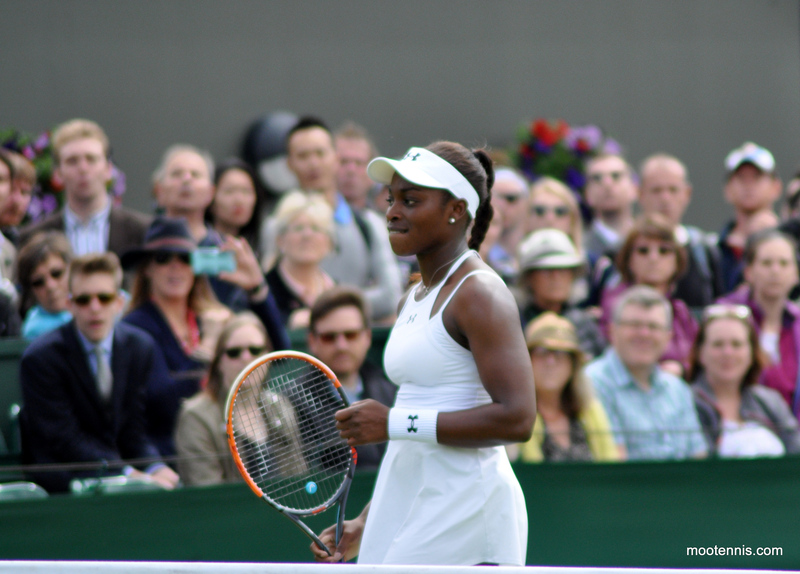 The only former champion in the draw is Sloane Stephens. Halep will be the clear favourite to win based on the consistency she has delivered over the past couple of months – that’s not to say this isn’t a testing draw including the likes of Sloane Stephens, Shelby Rogers and Ekaterina Makarova who have all beaten her before. From the bottom half, i’d fancy Camila Giorgi to be a dangerous floater. Who do you think will win Washington? Have your say in the tournament poll and as always, comments are appreciated! Good to see Simona playing again, but I hope she isn’t overdoing it; as far as I can see she’s booked to be playing solidly from now through to the US Open (including a title defence in Toronto). Yeah I did wonder that too with Simona as she will be playing Washington, Toronto and Cincy in three consecutive weeks. The hunt and peck typist favorite tennis player—Grammatikopoulou— has made it into the main draw in Washington.